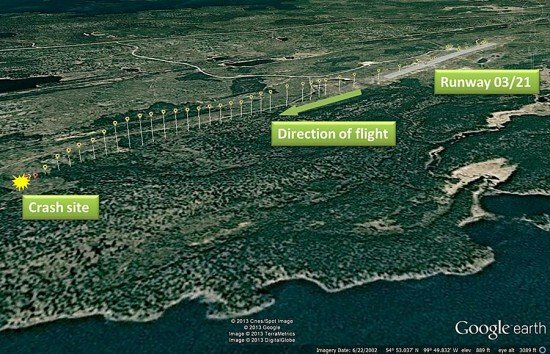 A TSB Canada investigation concluded that a loss of control and collision with terrain accident involving a Cessna 208B near the airport in Snow Lake, Manitoba, was caused by a combination of wing icing and overloading. On 18 November 2012, a Cessna 208B Grand Caravan passenger plane operated by Gogal Air Services Ltd. left Snow Lake en route to Winnipeg, Canada. Shortly after takeoff, the aircraft descended and struck the terrain in a wooded area approximately 1 mile beyond the end of the runway. The pilot did not survive, and the 7 passengers were seriously injured. The TSB Canada investigation found that the aircraft was approximately 600 pounds over its maximum gross takeoff weight limit and that the wing and tail leading edges were contaminated with ice. These factors had the combined effect of increasing the stall speed of the aircraft, reducing its takeoff and climb performance, and impairing the protection afforded by its stall warning system. As well, the investigation found that that the aircraft had likely been operating in instrument meteorological conditions on the day before the accident, conditions for which Gogal Air Services was not authorized. Gogal Air Services is a charter air operator and is certified to offer a non-scheduled air service. However, the report notes that a part of the company’s flight operations — moving mine workers between Winnipeg and the mine at Snow Lake — had some of the features of repetitive charter operations (such as scheduled service). These operations incur additional risks, such as customer expectations of performance in various weather conditions. In spite of these risks, Transport Canada does not provide the same degree of oversight as it does for a scheduled operator. Because of this, the risks in the operator’s activities may not be fully evaluated.